Legendary music producer Jim Dickinson passed away over the weekend. The North Mississippi Allstars have lost their father, Bob Dylan has lost a “brother,” rock and roll has lost one of its great cult heroes and Memphis has lost a musical icon with the death of Jim Dickinson. The 67-year-old Dickinson passed away early Saturday morning in his sleep. The Memphis native and longtime Mississippi resident had been in failing health for the past few months and was recuperating from heart surgery at Methodist Extended Care Hospital. 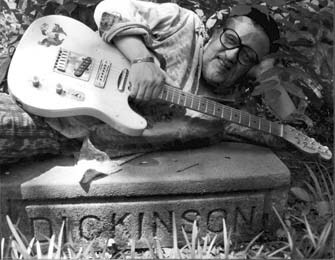 During the course of his colorful half-century career, Dickinson built a worldwide reputation as a session player for the likes of Dylan and The Rolling Stones, a producer for influential groups including Big Star and The Replacements, a sometime solo artist and the patriarch of a small musical dynasty through his sons, Cody and Luther Dickinson of the North Mississippi Allstars. 1966: Cuts the song “Cadillac Man” for Sun Records, attracting the interest of his idol, Sam Phillips. 1969: Plays piano on “Wild Horses” for The Rolling Stones in Muscle Shoals, Ala.
1986: Rowdy Minneapolis rockers The Replacements come to Memphis to record the critically-acclaimed Pleased to Meet Me with Dickinson producing. 1997: Plays on Bob Dylan’s Grammy-winning “comeback” album Time Out of Mind. 2009: Releases his swan song, Dinosaurs Run in Circles, a collection of old pop standards.